sold out from the publisher for years. only occasionally appears on the secondary market. ++++ Brass Plaque with the legend "Fisherman's Wharf, San Francisco" ~~ Thomas Kinkade"
++++ Theme: Fisherman's Wharf San Francisco, boats, harbor. 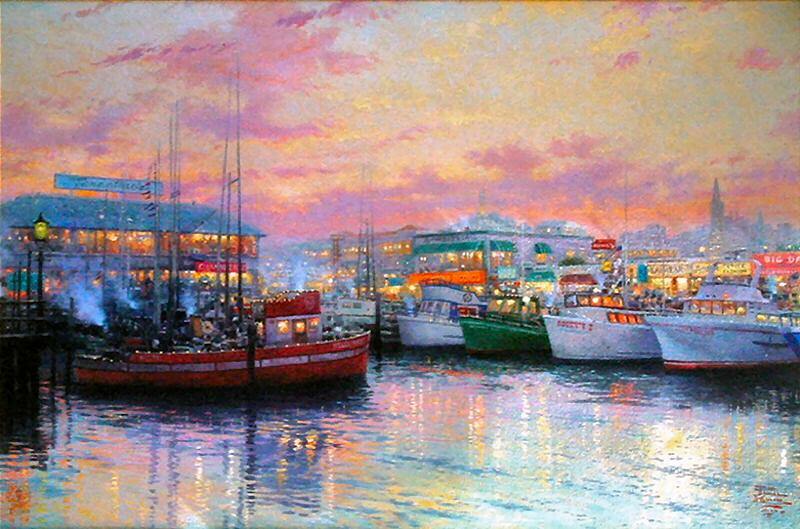 "A luminous sunset shrouds "Fisherman's Wharf, San Francisco" in a golden glow. Quaint fishing boats of all descriptions sleep quietly at their moorings, and overhead seagulls soar in the brisk sea air. What an enchanting location!" Fisherman's Wharf is one of San Francisco's most popular destinations. It is known for its historic waterfront, delicious seafood, spectacular sights. 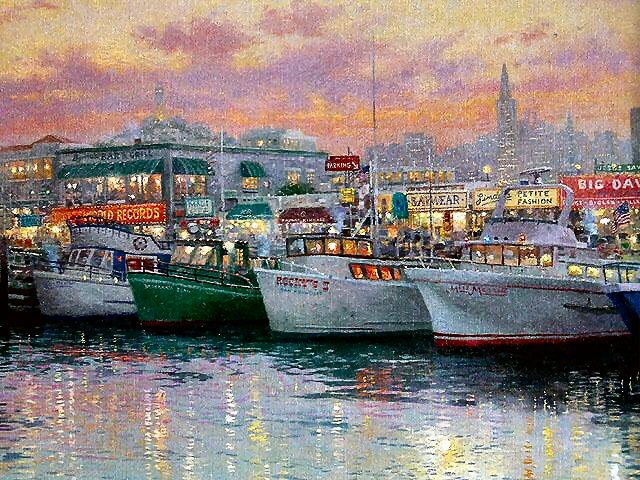 ~~~Tourists stroll along this city's historic Fisherman's Wharf. Here they can peer down at the fishing craft gently riding in the calm water, or pause to watch fishermen mending a net. Most of the boats in view belong to a "third generation" of fishing craft which have made history at the "Wharf". 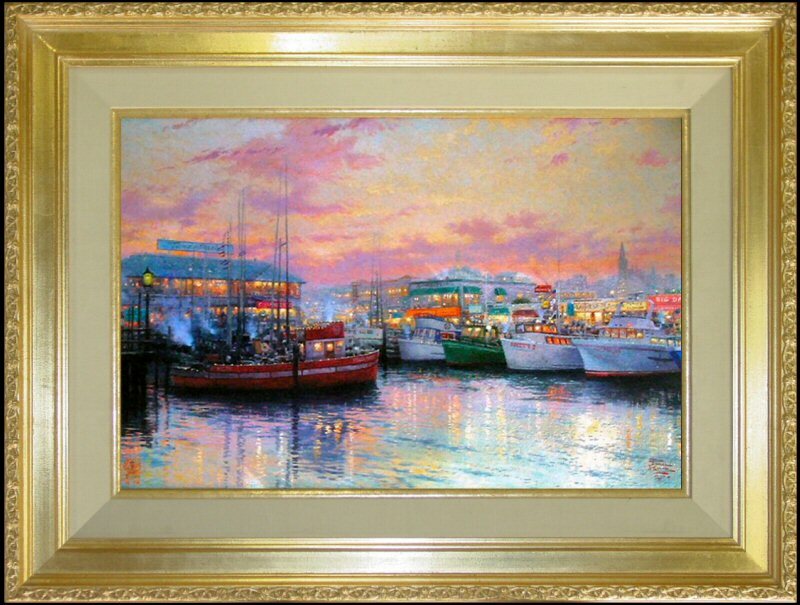 ~~~In those older days the fishermen got their news about the weather from Nature instead of a radio report. If the moon was in the east, the tide was coming in; or if in the west, the tide was flowing out the Golden Gate. A circle around the moon meant rain. Porpoises playing around the boat indicated a bad wind was brewing. ~~~Old timers around Fisherman's Wharf have other tales to tell, recalled from the period of the last sailboats. It was hard work. If the boat was becalmed, they waited long hours for a breeze, or got out the oars and rowed. 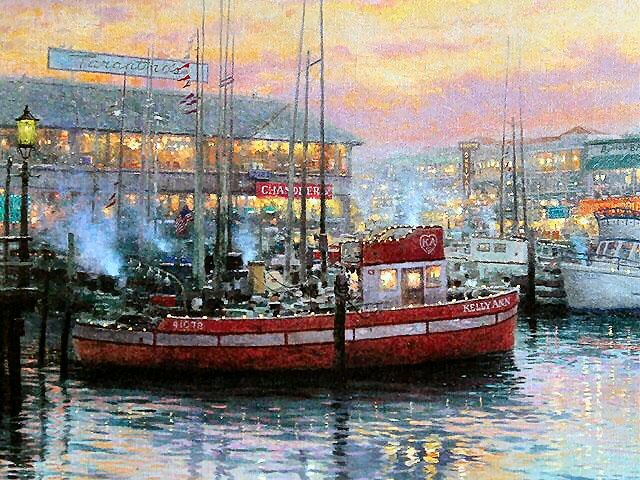 ~~~In Thom's creation of "Fisherman's Wharf" you can almost smell a fishy smell, feel the odor of the sea air, feel the water ripple gently.